To the idiots that came up to me, don’t come up to me assuming that I took your picture. I am allowed to take your picture without your consent. You are at a public metting in a public place, therefore I have the right. Your fair game. Get over it. The picture was bad anyway and I wasn’t going to use it, but now I am. Nice Sunglasses. 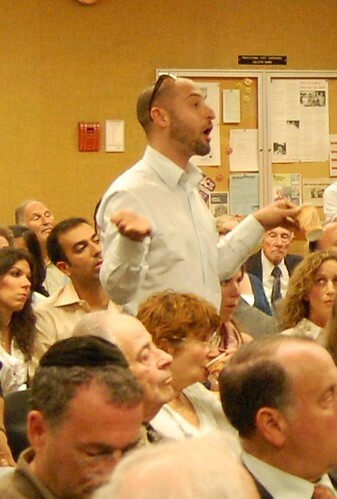 In another incident someone who signed up to speak to the community board even came up to Sheepsheadbites.com and said that his statements could not be quoted without his permission, you too are fair game. NIMBY – Not In My Back Yard. Having dealt with disabled people all my life and being one myself I find this type of behavoir appalling. Developmental challenged people are not “sexual deviants”. Illinformed and lack of understanding leads to the type of comments that took place at CB15’s meeting. If you do not know what a developmental challenged person is, ask your doctor. II live on a block with a home for developmentally challenged persons that has been around for more than 30 years, and you’d never know it was there. Not only that, but they are appreciative of any community involvement (even setting up a board for neighborhood concerns) but they work extremely hard to maintain their facility and address any issues. It’s a shame I missed this meeting (emergency meeting for another group). I would’ve had a word or two for the neighbors. It’s all ignorance and stupidity. I was at the board Meeting and Yes some from the Community were upset and lack the respect of the diabled but the disrespect the Board was giving the community where this home is being put waas FAR WORSE and asked was ther a Group Home on any of the blocks the Board memebers lived were not answered and before anyone could speak the chairperson Scavo stated that unless there was a home within 200 – 400 ft they would not turn down the application which was unfair to say and to actually state that Chairperson Scavo kept the meeting going is understatement she did not want hear anything about the fact that CB15 is the most saturated with these group homes then anyother CB nor that there is a dormetory within 400ft of the propsed site. Maybe CB15 should be looked into as to whetehr or not there is some kind of Collusion going on since there minds were made up before the meeting even started. Holy Run on sentence batman! I know you know how to use a period.. since you used one at the end of that block of text. Try spreading some around. You can’t use your name. I didn’t think I had to be so grammatically correct. Just like CB15 they don’t know how to be correct except when getting paid off. I guess the fact that your anonymous id that you must be one of the corrupt CB members. 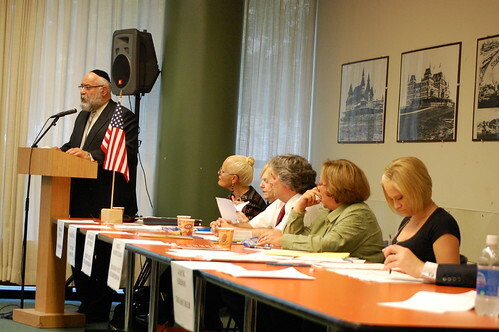 I also was at CB15 meeting last night and thought the actions by Chairperson Scavo was out of line. It was the first time at a CB meeting and was totally appalled by the actions of Ms. Scavo. The community is invited to voice there opinion and concerns and was not given the chance. I think as a community we need our elected officials to answer for this when it comes time for the next election I think a change is in order if concerned citizens are neglected and treated like they were last night. Give Theresa Scavo an ounce of credit for all that she does and all that she is effortlessly involved in. IMHO, she does a great job and offers her support and help to all. She’s been there to assist more than just CB15 many times over, expecting nothing in return. While I wasn’t at the meeting, it sounds like the neighbors were out of control, and outbursts and lack of order doesn’t fly at CB15. I’ve been going to meetings at CB15 for years and I can say that Chairperson Scavo is the best chairperson in many years. As far as “saturation” is concerned – it’s a technical term used by the agency, which means that common sense definitions do not apply. So even though CB15 may have a large number ofthese kinds of homes within it, the definition only refers to the number of homes within 200-400 feet of the applicant. If you object to he definition, then lobby for it to be changed in the future. And this affects GB how? Its news and effects the larger community. I gotta know whats going on outside our area. Whatever changes happen outside of the community will happen here eventually. 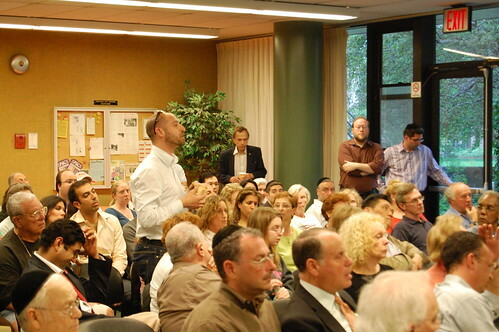 I dont see anyone else from gerritsen beach (without an agenda) going to these meetings. I’m learning from other communities mistakes. I can only image the things WE would say if an organization was going to opening a group home in Gerritsen Beach. LOL, commenting almost a year later… you’re really digging back to try to attack someone. Good job numbnuts. Beautifully written article, I must say. I wonder if this article is as corrupt as Community Board 15. …and your manners are so defined, you are an example to live by. Give Theresa Scavo an ounce of credit for all that she does and all that she is effortlessly involved in. IMHO, she does a great job and offers her support and help to all. Sheâ€™s been there to assist more than just CB15 many times over, expecting nothing in return. You canâ€™t use your name. I didnâ€™t think I had to be so grammatically correct. Just like CB15 they donâ€™t know how to be correct except when getting paid off. I guess the fact that your anonymous id that you must be one of the corrupt CB members. I know “geez louise” is Scavo. it is because I have been an observer for some months and am cautious til I find out more on the is this corruption and ways to handle and approach it. We should all make an effort to stop this. Stop what? A group home from may? I know I am really awesome. Its been awhile since i read this post, and i realize that everything you quoted was hysterical. Boy am I funny. There is no corruption other than the normal stupid politics, get over it. If you do actually have something email me and I will post it.